Have you guys ever been bold enough to have this much color in one space? I'm working on it, it's slow going for sure but it's definitely something I'm working towards. Like, maybe one day I'll have a room with the same gorgeous deep blue like this one. 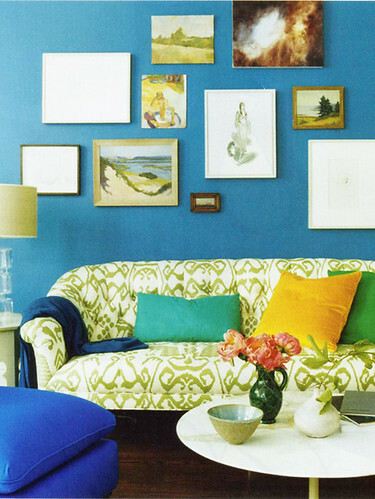 Or use colorful, fun prints on furniture just as the sofa above. I do have to say though that I love to add colorful flowers in my rooms. Flowers really do add that bit of color that a room might need. Just like the room above, if it didn't have that pop of pink in there, it would just be too many blues and greens. I actually just purchased a settee, a very worn-out settee, that needs a new upholstery job, and have been thinking of the kinds of fabric I would want to re-upholster it in. A fun, fresh print would be something I would want to try out. The problem with me is that I like all sorts of colors and fabrics so it's hard to pick just one. Hopefully, I'll pick one out soon cause I really want to use the settee asap. Hi- I just happened across your blog via an ad you have up on CL. I live in Annapolis too! and have a serious mid-century modern furniture problem- I have had a large sofa, an arm chair and 12 dining room chairs (I told you I have a problem!) reupholstered by a nice but quirky family upholstery shop in Edgewater- super reasonable, let you provide your own fabric, etc. Also I have ordered tons of super reasonable fabric (free samples) from the website newtoto.com- definitely check them out! Thank you so much for the tip - I'll have to check out that website for fabrics! Any chance you know the name of the upholstery shop in Edgewater? I've been trying to find a reasonably priced upholsterer around here but have had no luck yet.